Doug Eaton posted a message to lugnet.robotics with a pointer to the details of the VLL protocol which he reverse-engineered. As a legOS programming exercise I wrote a small library to transmit VLL codes using the LED in the LEGO light sensor. You can download the source which includes a diff to kernel/dsensor.c required to enable the sensor access that vll.c needs. You can add VLL to the kernel if you like, or just compile it into your own applications. It works with my MicroScout! I transcribed the VLL codes from the Scout SDK into the header file for your convenience. You can send codes back to back in a tight loop and the library will ensure that they are padded. The light sensor LED is much dimmer than the Scout's. If you point a Scout directly at the MicroScout it can communicate from several inches away. The small LED on the light sensor only has a useful VLL range of about one inch (3cm). The LED is much slower than the Scout's. It can't transition from off to on as quickly (or the interface electronics buffer the signal too much). The RCX can transmit one VLL code in about 0.4s. The Scout is at least 3 times faster. This means that the RCX can't keep the MicroScout's motor turning constantly in immediate mode. You can't use the light sensor as a light sensor simultaneously. This is due to my hack to dsensor.c which gives the VLL library full control over the port being used. The interrupt handler can't drop the output voltage momentarily to read the sensor. It's possible that there is a better way to patch the kernel to support this, or I may be able to poll the sensor in a VLL library routine. You can init and stop the VLL port in a loop if you have to, but you'll have to wait for the light sensor readings to settle each time. You can't receive VLL. Well, that's not so bad, since it's not even clear that the Scout can do that! You can only have on VLL output port at a time. This seemed like plenty to me. Okay, I admit, I'll probably never use this for anything. On the other hand, if you are big into MicroScout programming, or you have a Code Pilot, it might be useful to have an RCX app that lets you build small programs on the console of the RCX. If this fries your light sensor, I take no responsibility! You are trying this at your own risk. About a day after I announced this code for legOS, Jin Sato announced a VLL library for NQC written by Shigeru Makino. 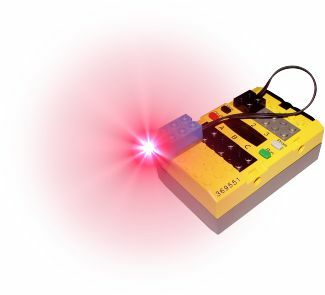 They have code to use the light sensor as an output device and also support using a LEGO lamp connected to a motor output. Due to the limitations of NQC their transmit rate appears to be about one third that of the legOS version.